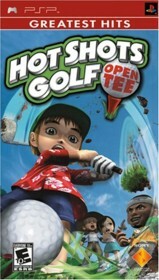 Hot Shots Golf: Open Tee is a Playstation Portable game in the Sports genre. The game was published by Sony and developed by Clap Hanz. The game has an ESRB Rating of E (Everyone 6+) and was released on 2005-05-03. The game's official site can be found at us.playstation.com/hotshotsgolf. A very good golf game that perfectly combines realism and arcade elements. I recently decided to play an old golf game I had lying around for my PlayStation portable. This has always been my favorite portable psp golf game and I would also say it is the best portable golf game on any portable system. The basic elements of the console versions are intact. Everything from the obscure and zany cutesy characters to the crazy courses are all here on the psp. The graphics and sound are excellent and really keep you tuned into the game. The basic game consists of a various gameplay elements such as a career type mode in which you level up your golfer, a training mode in which you can practice any course and the game even has a challenge mode which will let you unlock even more content. The coolest part of the game is that you are free to customize your golfers clothes and accessories however you see fit...if you want to have your golfer go around the course wearing a car suit (yup a car) you can! This really adds to the fun. Overall this game is very good and I recommend it to any golf fan and especially to gamers who played the console versions.